Mortgages are great; they make it possible to buy a home even if you don't have hundreds of thousands of dollars laying around in the bank. But you know what's even better? Paying your mortgage off. There are a few key ways you can pay off your mortgage quicker than expected and save money. Here are a few tips to get 'mortgage-free' ahead of schedule and cut the interest along the way...$66,342's worth on an average Canadian mortgage, to be exact! 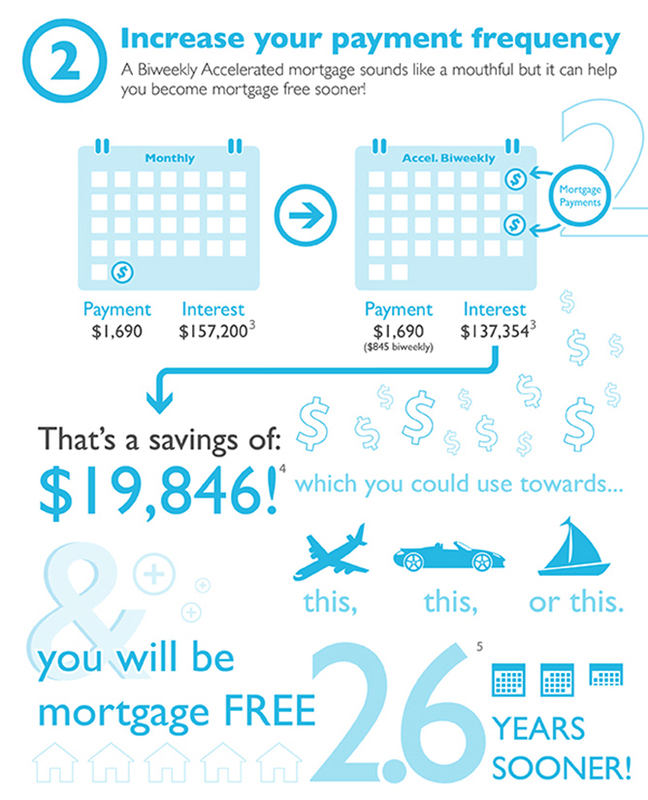 $1,000 extra a year towards your mortgage may not seem like a lot, but it sure does add up. 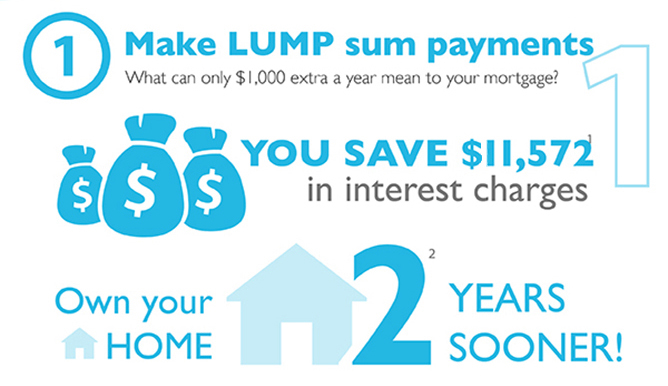 Make this extra payment every year and you'll own your home two years sooner. Not only that, but you'll save $11,572 in interest in the long run. The earlier you make these lump sum payments (also called prepayments) the better, but some lenders will place restrictions on when and how much you can pay (there also may be a fee if you exceed certain prepayment amounts). Check with your lender to see what’s possible to get that balance down. Split your monthly mortgage payment into two - pay every two weeks instead and you have a lot to gain. An accelerated bi-weekly mortgage squeezes some extra payments into the year but means you'll be mortgage-free 2.6 years sooner than making monthly payments. This can save you big in interest too: $19,846 over the course of your mortgage. Now think about all the things you could use that money for. Cut down the amount of years you’ll be paying down your mortgage and see big savings on the back end. 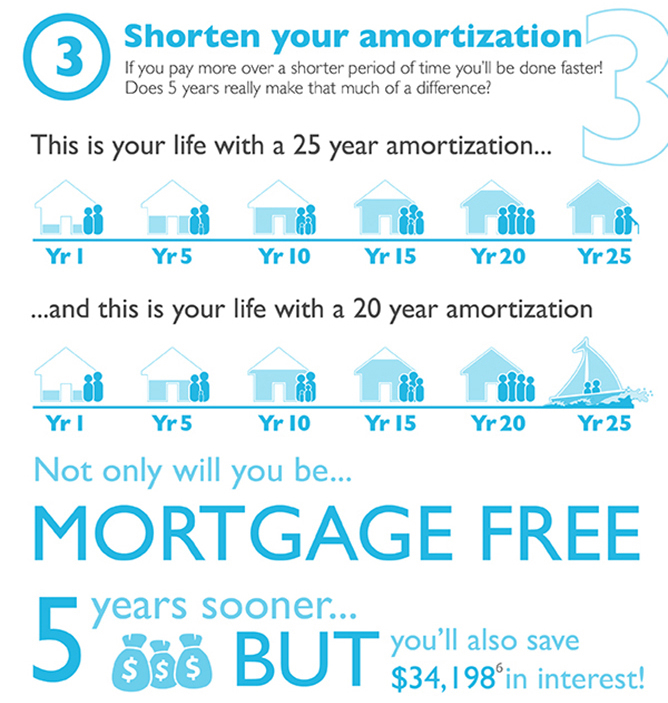 Choose a mortgage with a 20-year amortization instead of a 25-year amortization and you’ll be mortgage free five years faster. Your mortgage payments will be higher every month, but it will be worth it; cutting five years off your mortgage will save you a total $34,198 in interest. Add it all together and you’ll save $66,342 in interest over the life of your mortgage AND pay all of it off five years sooner! Keep in mind, another very simple way to pay off your mortgage faster and accrue less interest is to increase the amount of your regular mortgage payments. Even a little bit, say $50 a payment, can make a big difference over 20 years. Remember, once you increase your payment amount you won’t be able to lower it until the end of your term, so pick an amount that is sustainable for your budget. The end of your mortgage term may also be a chance to save money. When you renew or renegotiate your mortgage you may be able to get a lower interest rate. Of course, you could reduce the amount of your regular payments OR you could make a move to pay off your mortgage faster. Keep the amount the same (or even increase it) and see your regular payments go a lot further in paying down your balance.